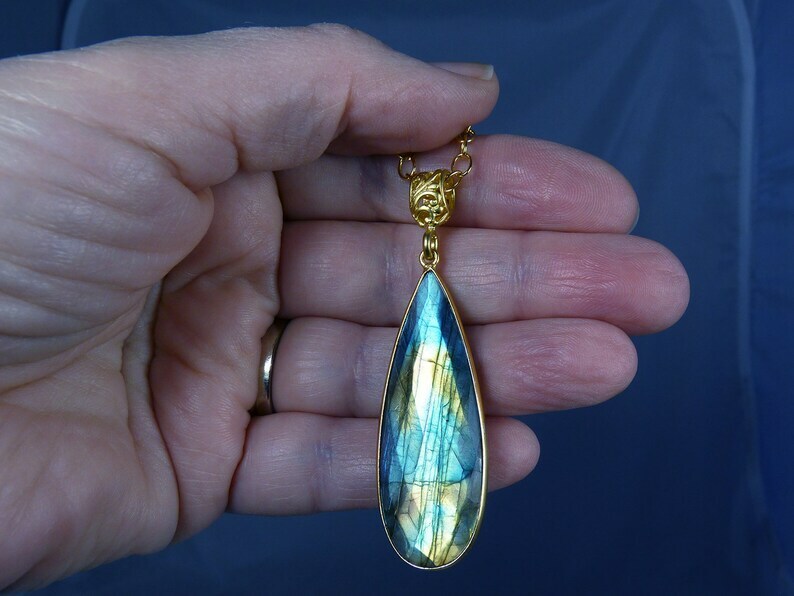 Huge, flashy, faceted, bezel-set, multicolor labradorite and gold teardrop pendant necklace. This necklace was difficult to photograph, and it is even prettier in person. The huge and super flashy labradorite teardrop is beautifully faceted, and it is set in a gold-plated brass bezel. One side of the gem glows with bright iridescent turquoise, aqua, copper, and gold hues from many different angles as it catches the light. The other side lights up with vibrant turquoise, aqua, copper, and blue. Both sides of the pendant are shown in the photographs. Like all the labradorite jewelry in my Etsy shop, this is a natural and untreated gemstone. The labradorite teardrop measures an impressive 46mm x 18mm x 7mm (1 3/4" x 11/16" x 1/4"), not including the ring soldered to the top of the bezel. The pendant is suspended from an elegant heavyweight vermeil (gold-plated sterling silver) bail with a matte gold finish, and it dangles 62mm (2 1/2") from a substantial 14K gold filled chain that fastens securely with a large 14K gold filled lobster claw clasp. The necklace is shown with a 17" chain in the photographs. The pendant is removable, so you can also use the luxurious chain with other pendants that have large enough loops or bails. Both sides of this eye-catching labradorite pendant necklace flash and glow with gorgeous colors! When labradorite catches the light, it can shift from subtle silvery gray or gray green to iridescent brilliance. The bright color flashes make it fascinating to watch. Please remember that every labradorite gem flashes its colors as it reflects light, so it can look very different at different angles and in different lighting conditions. In low light, it may appear mostly gray. Check out RazzleBedazzle's FABULOUS labradorite jewelry collection!